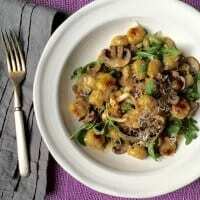 Buttery sautèed mushrooms and fluffy gnocchi is simple to put together for a weeknight dinner. In a rush I buy the pre sliced mushrooms and save a step. If you find a variety of wild mushrooms like beech or enoki, play around and add them in! Simmer a large pot of salted water and cook gnocchi until it floats, about 2 minutes. Remove and drain; set aside. Meanwhile heat butter and 1 tablespoon olive oil in a nonstick skillet over medium-high heat and add sliced mushrooms and shallots. Cook, stirring frequently, until mushrooms are soft and almost all the liquid is gone. Add the beech mushrooms (if using) and salt. Cook 3 minutes more just to heat beech mushrooms through. Transfer mixture to a bowl or plate and place skillet over heat again. Add the remaining 2 tablespoons olive oil and the cooked gnocchi. Move gnocchi around to cover bottom of skillet and let cook, without stirring, about 2 minutes to brown. Add chicken broth, cream and Parmesan and stir to move gnocchi from the bottom of the pan. Let mixture simmer until sauce is slightly thickened, about 1 minute. Add mushrooms back to skillet and stir to combine. Serve gnocchi immediately with a sprinkling of arugula and red pepper flakes if desired. Season to taste with extra salt.